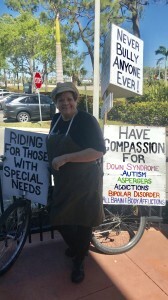 Thank you to Kelly who had a deep interest in my mission to raise awareness for those with special needs. She has an adult son who through her comfort as a mother to him, is able to live a fairly normal life. A loving mom makes all the difference in the world. This entry was posted on Saturday, March 24th, 2018 at 10:02 am	and is filed under Kindness. You can follow any responses to this entry through the RSS 2.0 feed. You can leave a response, or trackback from your own site.